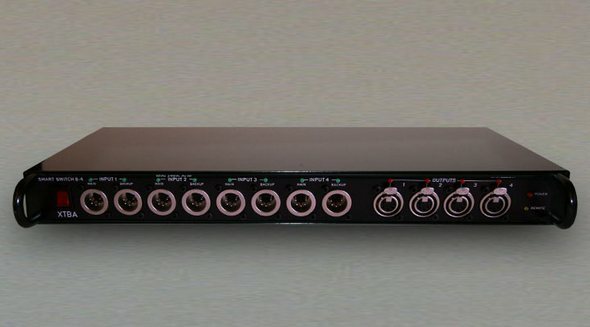 XTBA's Smart Switch 8:4 allows up to four universes of DMX to have an on-line back up. In the event of a data failure on any of the active main inputs the Smart Switch 8:4 will check the available backup inputs. If all are available the unit will switch all inputs to back up. If a back up is not available on an active channel then only the input that has failed will be switched to backup. The unit also has a remote facility to allow the main/backups to be switched manually. This allows multi universe DMX systems to have full on line back up.